If there’s anything cuter than baby goats, I don’t know what it is. Especially when those baby goats are scrambling onto your back while you’re in plank pose or chewing on your shoelaces during downward-facing dog. Hot diggity dog! Such an opportunity seemed custom-made for me. I like yoga. I like goats. And I’m always on the prowl for a column. What could be better than goat yoga? That’s not exactly how things went in my class. The day was cold and wet, but the rafters of the barn at Double C Farm were festooned with party lights. Fragrant hay covered the floor. Indian music played softly in the background and rain pattered against the metal roof. Hostess Arna Shofner, who moved to White County about a year ago, welcomed everyone and introduced yoga instructor Laurie Hall. I sat cross-legged on my mat with my eyes closed, trying to maintain calm and focus. But when Arna opened the gate to the goat pen, it instantly became clear that I couldn’t take notes and snap cell phone pictures and practice yoga all at the same time. The herd of six Norwegian dwarf goats consisted of two adolescents and four babies. The youngest, both wearing sweaters, were only three days old. The goats bounced around the barn like kangaroos. They hopped onto the bush hog and the hay bales. They sprawled on people’s heads and nuzzled their necks. Truth be told, there was very little calm or focus that morning. But there was a whole lot of laughter. We might not have stretched our hamstrings or opened up our rib cages, but everyone’s face muscles got an outstanding workout. 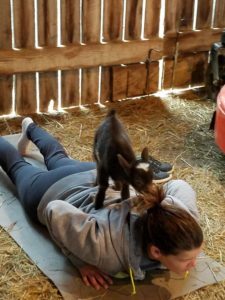 Want to try goat yoga for yourself? Arna and Laurie will hold another class on April 28. To learn more, call Arna at (860) 861-0498 or visit Double C Farm’s Facebook page. You might not achieve zen, but I guarantee you’ll have a whole lot of fun.